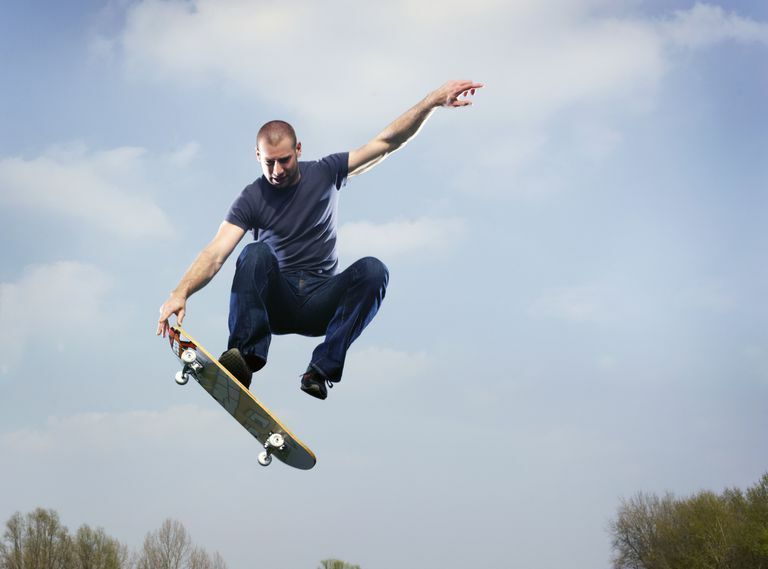 The "no comply" is an old school skateboarding trick, invented by Neil Blender, a pro skater in the '80s. A no comply is usually done on flat ground, like a skatepark or parking lot. In a no comply, the skater pops the board into the air using his back knee while planting his front foot on the ground for only a moment. It's not a difficult trick and can look very cool. Also, once you've mastered the no comply, there are a million variations to the trick that you can try. Before learning to do this trick, you should be comfortable with simply skateboarding around. You don't really need to know how to ollie, but it can help. The main thing is to be comfortable and confident in simply riding your skateboard. If you're ready to learn how to do the no comply, picture yourself doing the trick—visualization actually helps quite a bit. You can practice a no comply without trying the entire trick at once. To practice this trick, find a flat spot and stand next to your skateboard. Put your back foot on the tail of the board, like you were going to do an ollie, but leave your front foot on the ground next to the board. Now practice pushing down the tail, catching the curve of the nose with your knee, and jumping up in the air. Try that a few times. You'll start to understand how it's important to not just pop the tail like an ollie but to give it a little scoop as well. First, you need a long, flat space to practice on. You can try and learn to no comply standing still if you want to, but it is better to try it rolling; it's more natural that way. Give yourself a few pushes and get rolling at a fairly moderate speed. Place your back foot across the tail of the board, just like you did in practice. Your front foot should be on the nose of the board, right on the tip. Crouch down while rolling along and put pressure on your back foot. When you have pressure on the tail, slip your front foot off of your board and plant it on the ground next to you, on the heel side of your board. Taking your front foot off the nose, with all the pressure on the tail, is going to make the nose of the board pop up. As the nose of the board pops up, jump. This is a lot like an ollie for your back foot. For your front foot, which is on the ground, you just jump. As the nose pops up, hit it with your back knee. This will probably hurt the first few times you do it. Don't worry, the better you get, the more control you'll have over this part. If you do a no comply smoothly, you don't need to slam the board into your knee -- it will look more like the board just pops up against your entire lower leg. This is a good way to do it because your pants will latch onto the grip tape, and you can bring the board up along with you in a controlled way. Remember, as all of this happens, you should be jumping. When your knee hits the board, it will bounce it back down. Place your front foot back on the nose of the board and slam your foot down. Lean forward, toward the nose of your board. You want to land clean and ride away. Kicking the board out: Sometimes skaters have a hard time where they go for the no comply but end up kicking the board out in front of them and losing it. This is usually a problem with not getting the scoop in with the back foot. You don't want to just pop the tail and then hope for the best—you want to get the scoop in so that the board pops up against your leg, all in a controlled way. Too low: This is a common problem and happens because of a lack of commitment. You need to make sure you really crouch down and give this trick a jump, not just a little hop. Losing the front foot: If you have a hard time getting your front foot back on the board, this could be because you are scared or because you don't have much control. Either way, take it slow and practice some more. It'll come. Keep practicing and get creative. The no comply is one of the few skateboard tricks that, like the boneless, let you put one of your feet on the ground. This opens the doors for all kinds of inventiveness.